Mirza Ghalib, full name Mirza Asadullah Khan Beig, pen name ‘Ghalib’ (1797-1869) was a famous Urdu- and Persian-language poet of India. He is best known for his lyrical and spiritual ghazals. 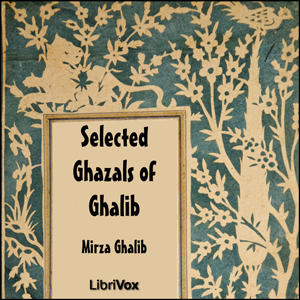 Ghazal is a form of poetry in couplets. In a ghazal, each couplet is self-contained and generally unconnected with the next. Ghalib was born in Agra, in northern India, and was raised by his uncle. Ghalib had no formal education, but was tutored in Persian by Muhammad Mu'azzam, a noted scholar of the time. He was married in 1810 to Umrao Begum, the niece of Nawab Ahmad Baksh Khan who was the ruler of Ferozepur and Loharu at that time. Ghalib was introduced to the elite circle of intellectuals and artists that surrounded the Indian royal family in Delhi because of his father in law. In 1821 he compiled his first collection of Urdu verse. Deewan e Ghalib, Nuskha e Hamida was Published in 1828. soon after the publication of his Urdu poetry collection Ghalib switched to writing entirely in Persian, also known as Farsi. In 1826, on the death of Ghalib's uncle, the British government began providing Ghalib and his family with a small pension for the military services of his uncle. Despite this income, Ghalib remained nearly destitute for most of his life. Ghalib was also a poetry teacher of the King, Bahadur Sha Zafar, who himself was a very nice poet. This recording was made from a printed copy of Deewan e Ghalib, Nuskha e Hamida published in 1828.